Google has announced that it has helped bring more of the famed Dead Sea Scrolls to the internet, because nothing says 'in the beginning' like a piece of ancient papyrus. Yep, for those of you who have been stuck waiting to see a 2,000-year-old version of the 10 commandments (spoiler alert: apparently killing is bad) or the Book of Genesis on flattened reeds, then all of your Christmases have come at once. That's because Google has continued its sterling work on digitising the Dead Sea Scrolls – the ancient scraps of document that represent the oldest known biblical manuscripts. 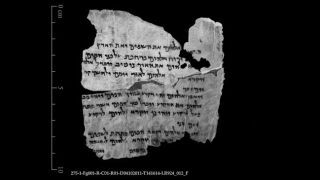 The Leon Levy Dead Sea Scrolls Digital Library has now been launched, and will no doubt attract huge interest from scholars and those with a penchant for religious artefacts. The Dead Sea Scrolls were preserved in a dark cave in a desert meaning that they managed to survive for two millennia and are considered one of archaeology's greatest treasures. Google has already played a large part in bringing this early documentation to the digital world in partnership with the Israel Antiquities Authority, as it looks to collect the world's data online.